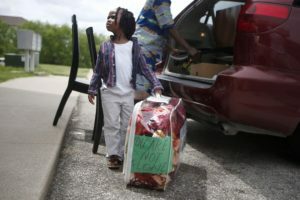 A new national report makes clear that children of color and children living in immigrant families face persistent challenges that Iowa and other states aren’t adequately addressing. The report, “2017 Race for Results: Building a Path to Opportunity for All Children,” was released last week by the Annie E. Casey Foundation. It details how such challenges are creating opportunity gaps, especially for African-American and Latino children in Iowa. “Iowans are used to seeing their state appear high in national rankings. But the reality is that Iowa’s environment for children — for children in every racial and ethnic group — is at best in the middle of the pack,” said Anne Discher, interim executive director of the Child and Family Policy Center, which supports the Casey Foundation’s Kids Count initiative in Iowa. The report measures children’s progress at the national and state level on education, health and economic milestones by racial and ethnic groups. It provides a scale of 1 to 1,000 for its rankings, with 1,000 being the highest. For white children in immigrant families, as well as Asian and Pacific Islander children in immigrant families, Iowa is close to the national average. White children in immigrant families across the U.S. receive a ranking of 713, for instance. Those children living in Iowa have a ranking of 744. Children of Asian and Pacific Islander descent have a ranking of 783 nationally, and a score of 672 in Iowa. Children found most at-risk, statewide and nationally, were African Americans and Latinos. Iowa barely edges out the national average with rankings of 406 for African Americans and 458 for Latinos. Among states with sufficient data, the Hawkeye State ranks 15th for white children, 18th for Latino children, 19th for African-American children, and 37th for Asian and Pacific Islander children. More than 77,000 Iowa children are either immigrants to this country or have parents who are immigrants, according to the report. And, of those, 80 percent are children of color; nearly half Latino. When compared to the general population of Iowa, this group faces distinct and significant challenges that can prevent well-being and upward mobility. For instance, about 49 percent of children in immigrant families benefit from family income that is twice the federal poverty level, which means some basic needs aren’t being met. About 30 percent live in high-poverty neighborhoods. While roughly 65 percent of U.S.-born children in Iowa are enrolled in early childhood education programs, less than half (47 percent) of children in immigrant families get a head start. The good news for Iowans is that children of immigrant families typically grow up in two-parent households (81 percent — which is nearly 10 percentage points higher than their U.S.-born peers), most are in school or working (86 percent — which is just below the U.S.-born rate of 90 percent), and many (45 percent — which is nearly identical to the U.S.-born rates) have completed some level of higher education. Many of these positive indicators, however, now are endangered by a shifting political climate on immigration and wavering public perceptions regarding immigrants. • Keep families together, within their communities. • Help children in immigrant families meet key developmental milestones. • Increase economic opportunity for immigrant parents. “Making sure every kid has stability and a path to opportunity is fundamental to Iowans’ shared prosperity,” said Mike Crawford, who leads the Child and Family Policy Center’s Kids Count activities in Iowa. The first recommendation is largely the purview of federal immigration policies. Keeping families together and within welcoming communities requires child-centric immigration policies, including a federal carve out for families with children brought to or born in this country. When that doesn’t happen, when undocumented parents are deported, citizen children can become wards of the state and often suffer trauma and other hardships. It’s an expensive proposition for taxpayers, and a devastating scenario for the children. Developmental milestones can be achieved when immigrant families feel safe enough to access existing services. Too many immigrant families are living in fear that makes them hesitate to access financial, medical, educational and other resources they qualify for and need. Nationally, 88 percent of children living in immigrant households are U.S. citizens — about half of their parents are as well. To look at it from the opposite perspective, only 6 percent of children in immigrant families nationally are undocumented. All others are either U.S. citizens, lawful permanent residents or hold some other legal status. Likewise, only 21 percent of parents in these families are undocumented. Further 95 percent of these children are part of families who have been in the country for more than five years; most have parents who have been in the U.S. for 20 years or more. Economic opportunities come from public investment that trades existing and expensive safety-net programs for sustained policies that can lift low-wage earners out of poverty — housing and transportation access, for instance. It’s a policy shift that would not only lift up children of color, or children in immigrant families, but all U.S. children below the poverty line. Born here or elsewhere, these are our children — “our kids,” as Harvard sociologist Robert Putnam would say — and they are our future. We need to protect them, create policies that make their well-being a top priority, and invest in resources that help them thrive.